For my first post on French Contemporary art, I thought I'd share one of my favorite female artistes, Niki de Saint Phalle. 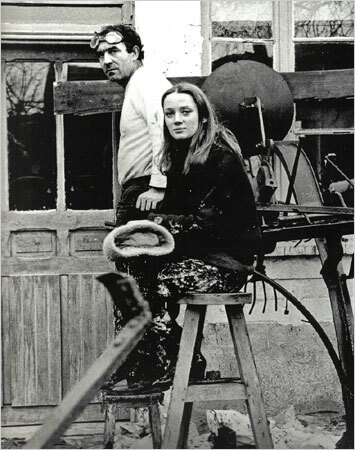 Niki de Saint Phalle's haute class, but financially broken family was driven out of Paris during the Great Depression. After reinstalling in New York in 1933, her mother, your typically glamorous parisienne, enrolled Niki in the prestigious Brearly School where she was promptly dismissed for painting red fig leaves on the school's statuary. From then on Niki was was sacheted from prep school to prep school until she learned to hone her beauty and chipped out shoulders into a modeling career. 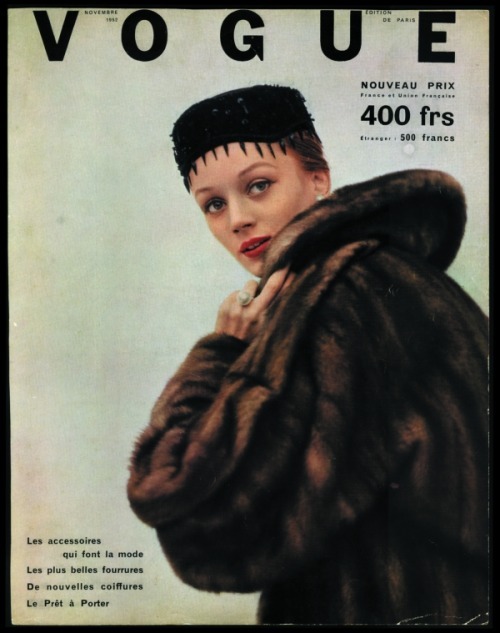 At the age of 16, her prim n' trim mademoiselle face appeared on the cover of Life Magazine and three years later on the cover of French Vogue. At 18, Niki eloped with childhood friend, Harry Matthews, shot-gunning herself into a life that she quickly grew to hate. In 1953, she suffered a tremendous nervous breakdown, moved to Spain and started to ferociously paint away her troubles. After dabbling briefly in oil painting and collage art, she famously turned to a new medium--the rifle. She cocked her gun, aimed and fired at giant paint-loaded canvases. 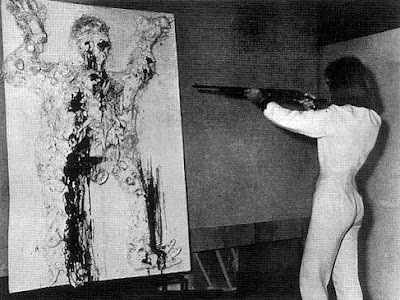 The point of the "shooting paintings" was to bomb, to FIRE!, to BLOW UP!! this house-cat life she had led by default. It was a big, loud NO! to her hypocritical, sexist society. Her next art phase had a lot to do with auto-destruction and the rabid consumption of pointless, plastic materials. That means a lot of dismembered Barbie dolls, shredded stuffed animals, and cheap "female" products strangely manipulated and cemented onto canvases. As the 1960s turned into the 1970s, Niki's name got bigger, and so did her art. Um... like a LOT bigger. In 1979, she acquired a stretch of land in Garavicchio, Tuscany and began the 19-year Tarot Garden project that she worked on into her seventies. The bright, fiber-glass Tarot women came to personify her entire career. A visual feast for critics, kids, and even the non-art-inclined, visitors can climb up the heads, slide down the tongues, walk between the legs, and look out the eyes of these creatures even today. How has your subject influenced French culture? Niki de Saint-Phalle was part of the 1970's feminist movement in France. Along with other famous french feminists like Simone de Beauvoir, her work challenged the conventional roles that women held in society at that time. It was not very "feminine" for a woman to pick up a rifle back then. Women were looked down upon for being boisterous and unconventional, when society expected them to look pretty, wear high heels, and act proper. Niki's work made French women, and women around the world, realize that if they have something to say, they are allowed to scream it, and if they have something to show the world, they can used big, loud colors. How has your subject influenced a particular cultural movement? 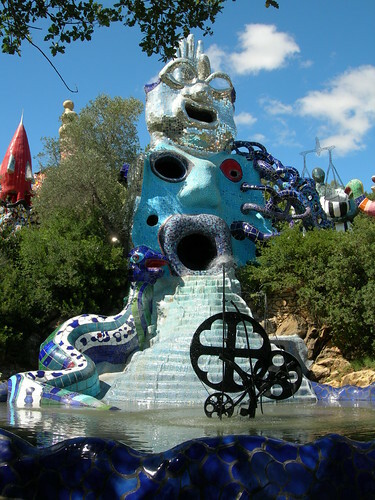 Niki de Saint Phalle is part of the New Realism movement, or Nouveau Realisme in french. New Realism was a form of abstract art popular in the 1960s. Members of this movement believed in taking elements from real life an incorporating them into their art. Basically, this means recycling material from the world around them and using it to make something that challenges the way the average person looks at it. The whole idea was to use art as a way to criticize reality. Niki's shooting paintings and Tarot women are an example of this. Here are a few Niki de Saint Phalle links for more information about Niki. elle est très intéressante! son art montre des émotions, mais il semble encore froid. il crée une pièce très émouvante. elle est aussi très belle! Je pense qu'il serait amusant de la connaître elle.